To place an order for any of the cakes detailed on the website, simply send me an email at gingerandthewhisks@gmail.com stating which of the ladies you would like, what size and the date you would need to receive the cake by. If you would like advice on what size cake would be best for your particular event, then again, don't hesitate to get in touch and I'll be happy to advise you. As I only take on a limited number of cakes a week, I ask for at least 3 days notice from the day of ordering but I am happy to take orders for further in advance too. Once I have confirmed everything with you via email, including delivery, I will ask for payment via bank transfer. I love any opportunity to tailor the cakes for special events and I'm always happy to discuss bespoke cake orders and larger, tiered versions of anything that takes your fancy. If you would to discuss a bespoke cake order, then email me at gingerandthewhisks@gmail.com with your ideas, dates and event specifics, and we can take it from there. For larger cakes I do ask for a non-refundable deposit of 50% to save the date, as well as at least two weeks notice. This is because I like to block out more time for bespoke orders to enable me to focus purely on your special day. All of the cakes work wonderfully as wedding cakes - take a look at some of the testimonials of the very happy brides I have worked with in the past - and in order to get everything just right, I always arrange an initial consultation and tasting as part of my bespoke bridal service. I am based in South West London and hand deliver all of the cakes within Zones 1-4. A £10 delivery charge will be added to the cost of any of the individual cakes listed. 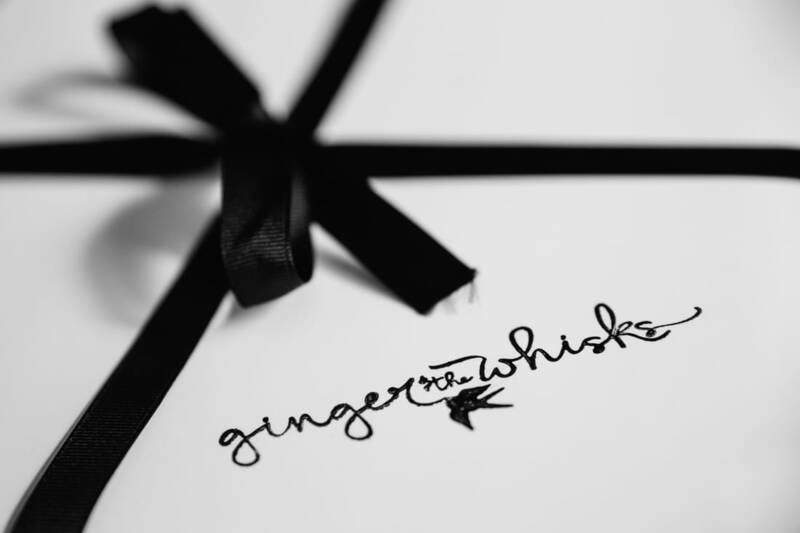 Each cake will arrive beautifully packaged in one of our ink-stamped boxes and finished with grosgrain ribbon. For larger cakes that will also involve assembling on arrival, there will be an additional charge but this will be agreed with you and worked into the price of any bespoke cake order.